Earn $2.39 in Rewards credit. Click to learn more. One shoe cover to rule them all. 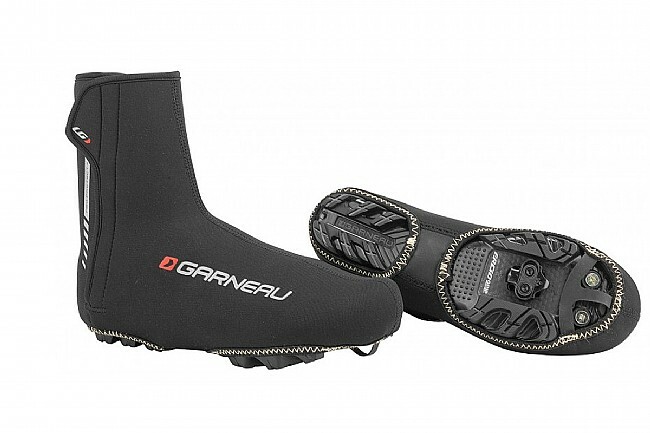 The Louis Garneau Neo Protect 3 Shoe Covers are a versatile, durable option for riders looking for complete coverage in both the road and mountain season. With a 2mm neoprene construction, the Neo Protect III delivers warmth regardless of how wet or dry it is. Extremely durable, warm, and easy to adjust, these shoe covers feature wide side hook-and-loop fasteners and large locking zippers, keeping this shoe cover in place all season long. 2mm Neoprene isolates feet from cold, providing added warmth. Wide side hook-and-loop fasteners for easy slip on and large locking zippers. 360º of reflectivity for improved visibility in low light conditions. Reinforced kevlar track under the foot with Hypalon rubber for walkability. 2 large holes for road or mountain cleats and heel traction. These are good down to about 35F for rides more than an hour. Lower than that and I have to wear my Wolfhammers. Feet and hands are always the challenge in winter riding conditions and these work well in the temp range. The side velcro is a bit harder to get on but stays in place until you take them off, so design-wise a good call. These shoe covers make a big difference on windy days and are pretty easy to pull on over my shoes. I love the generous amount of Velcro which keeps them closed! This is my first year riding in cold weather, so I found these and they definitely help in 40-50 degree weather with keeping the cold wind, especially on downhills from overwhelming your feet. In colder weather, you'll need something more to keep your toes warm. My go to shoe covers! I have big feet and these go on easy with the Velcro closure. Nice and snug. Good down in the 20s with some wool socks. Original pair is still going strong minus the patch from the dog bite! I wear size 13 US or 48 in EU. Have had all kinds of trouble finding booties and toe covers that fit. Not these - the XLs are a great fit. Two big thumbs up. Good booties keep my feet warm. Well made, prefer zipper closure in the rear over side Velcro. Easy on and off. Toasty warm for those days when 2 pairs of socks aren't enough.... good for rides below 32 degrees. Have not used them in the rain so don't know if you'll stay dry. I really like these shoe covers. Warm.